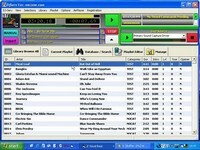 Dj software for budget online radio stations, home users and mobile djs. This software will allow you to catalog audio, make playlists manually or automatically, and stream the results to the world. It will play non-stop music for weeks (or months) on end if you set it up in fully automated mode. For advanced (PRO) mode, you can use the built-in rotation manager (scheduling software) to create playlists that will intelligently rotate your songs according to their categories, or other criteria you specify. Also included are scores of commands that allow you to set timed events, so the software will do exactly as you please, even if you are not there! Tour Budget Pro - This tour accounting software system was designed specifically for the entertainment industry, whether you're a local, regional, national or international entertainment group. EuroSinging - This is a multimedia database for Eurovision Song Contest, with many details of every participation, the ability to search for everything you want to know and many statistics. RQ Search and View - Search text in files in folders and subfolders and preview it in buil-in editor. Supports plain text, Rich Text Format (RTF), HTML (web pages) file formats. Briz Video Joiner - Powerful tool to join multiple video files into one larger video file.